In law, the unstated premise is often more important than the stated premise. Before making any comments about your thoughts about Arms Rules 2016, would like to know if you are a lawyer or have read the rules with a "legal eye" and what possible practical problems they are very likely to create in future? Re: RE: Re: RE: Re: New Arms Rules 2016 notified by Government of India! My 'Advocate-On-Record in Supreme Court' friend is going through the old and new acts & rules, and also the petition. We just printed the 350 pages and it will take 2-3 hours. Will keep you all updated. Sir I Am an air gun lover, I want to thank you for filing an PIL against 2016 gun law In Supreme Court of India. The 2016 gun law notifying that . 22 calliber air gun will need license is not logical. Since air gun does not use any propellent or gun powder, it can not be classified as fire arm. The air gun regardless of its caliber (.177,.22,.25) only shoots pellets. If goverment is worried that . 22 pellet is used for hunting/poaching and if that is the reason they brought . 22 cal air rifle under licensing then they are wrong because I can do the poaching/ hunting with . 177/stone/metal stick/my bare hands, but I will not do it cause I am not thar kind of peson( my kind is " live and let live")instad they should have crated law against hunting. I am 100 % shure that you will win this PIL and then goverment has to make changes in it or drop the 2016 law all together. YOU HAVE MY FULL SUPPORT AGAINST THIS IDIOTIC ARMS LAW 2016(about air gun part). GIVE IT A GOOD FIGHT IN COURT! Re: RE: Re: New Arms Rules 2016 notified by Government of India! Please check your email, sent specific points of law consisting of only 11 pages and consolidated petition of only 75 pages. Your lawyer friend can make changes or reduce or increase the size as he deems fit. The entire document for RKBA Writ, Public Interest Litigation, Special Leave Petition has been posted here viewtopic.php?f=4&t=25102 for everyone to read, understand, comment, and share it far and wide. Supreme Court stay on license for air guns!!! deepakvarde wrote: Supreme Court stay on license for air guns!!! The video is from 2014! This was to do with the litigation brought to court by PFA in Delhi High Court, which was later appealed in the Supreme Court. Since this pre-dates the Arms Rules 2016, it has no bearing on these Rules. Like many of us here, I also have a .22 air gun which I purchased in 1990 and is maintained in mint condition. I would like to know if any one had applied for license and the result of the same for their .22 air gun. I would like to follow the lead and comply myself to the law of the land. What is the latest position on the validity and implementation of the New Arms Rules 2016? Are they in force? What are the provisions in the New Rules for issue of licences for second and third weapons? miroflex wrote: What is the latest position on the validity and implementation of the New Arms Rules 2016? Are they in force? 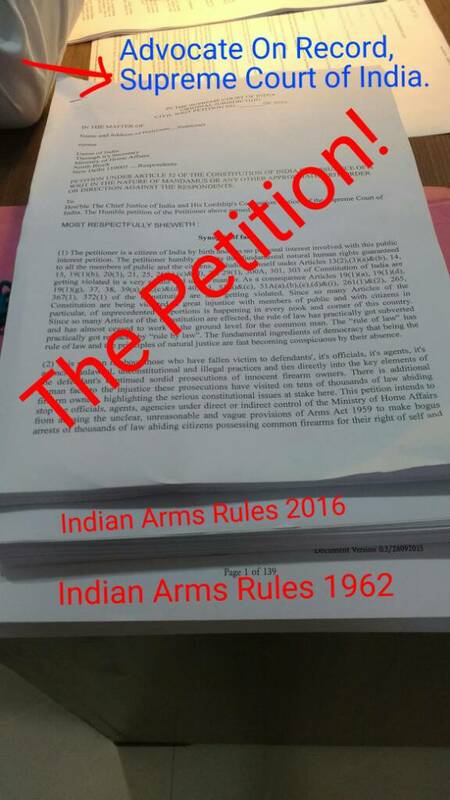 If my information is not incorrect, Arms Rules 2016 have not been presented in both houses of Parliament to be passed to the satisfaction of Section 44(3) of Arms Act 1959. Thus technically the new rules do not have force of law, but it appears they are being enforced illegally by licensing authorities. miroflex wrote: What are the provisions in the New Rules for issue of licences for second and third weapons? Anything that is very clearly mentioned in the parent legislation, it is not necessary for the same to be repeated in the sub ordinate legislation. Sub ordinate legislation cannot override or go against the parent legislation. Arms Act 1959 is the parent legislation, it's Rules are it's sub ordinate legislation. 3. How many shooters acquired MQS, shooting with Ashani and her sisters. RTI application may also be presented to OFB asking which of their guns are benchmarked against SAAMI etc standards . The reply of these RTI applications may be very well relevant in the Supreme Court in the matter of the present Writ . Has anyone applied for a license for their existing .22 airgun in delhi?? What has the licensing authority got to say? I own a precihole .22 rifle and I have no idea what to do. You think you were born in wrong country..and south africa is peaceful country...? ?